Madison Salyer is our Student-Athlete of the Week! Madison is a Senior on the Women's Tennis team at St. Francis DeSales High School in Columbus, Ohio. 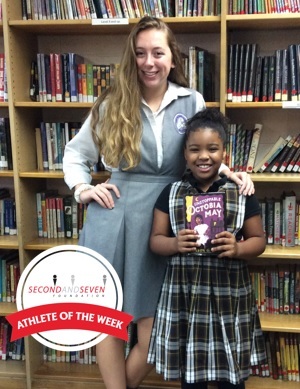 Madison partners with The 2nd & 7 Foundation as part of the St. Francis DeSales High School Read with a Stallion Program. Through this program, student-athletes from DeSales visit St. Anthony Parish School to read to the elementary students and to encourage them to value reading and education. Madison shares, "When I was a student at St. Anthony School it was instilled in me that serving my community and giving back was a way of life. As a Senior at St. Francis DeSales High School, that message has not changed. When I was approached about the Read with a Stallion Program that has partnered with 2nd & 7, I jumped at the chance to give back to a community that was so good to me. I love reading the Hog Mollies books and getting to know the students and I am honored to say that I am a part of these wonderful programs." Congratulations, Madison! We love your giving spirit!